Teachers, parents, and tutors use these excellent resources, designed by Linda Silbert, PhD and Al Silbert, EdD, to help kids develop reading and writing skills and to improve focus and self-esteem. The complete collection including all 20 Phonics Card Games integrates well with the Orton-Gillingham and Wilson methods which are used in many school districts to teach reading. 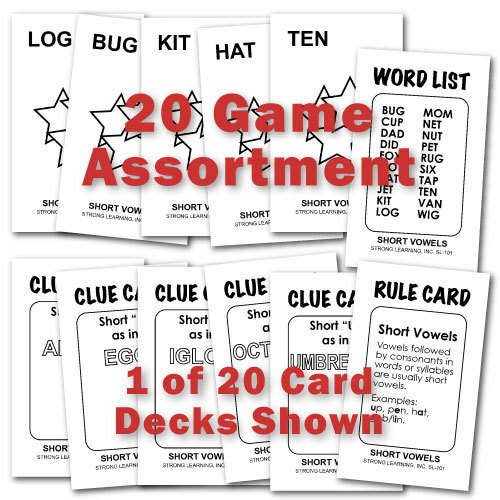 The complete 20-set Phonics Card Game collection includes game instructions and definitions of phonics words for Parents and Teachers. Get the complete 20-set Phonics Card Games collection today and start helping your child learn to read without boring phonics drills. Save 40%! Get the complete 20-set Phonics Card Games collection today and start helping your child learn to read without boring phonics drills.